This piece is gold and enamel with a gold attachment loop, clearly read gold hallmark "56", reverse with makers-mark "AK" (Albert Keibel), and is of lustrous garnet/ruby coloured red enamel. Attached to the piece, as you can see, is the original red and yellow sash that quite honesty looks as if it were made just yesterday. The center piece contains a hand painted cameo of St. Anne. Reverse cameo contains blue Imperial emblem. Dimensions are approximately 36 x 40 mm. This is a beautiful piece is in wonderful condition considering its age of now almost 117 years. I�ve never seen another exactly like it ... only similar as the style of these pieces continually changed slightly depending on the artisan, year produced, and the period in the Romanov Dynasty in which it was crafted. And, granted, since each was uniquely handcrafted, each has its own unique differences, especially within the hand painted cameos of St. Anne contained within the center. The Order of Saint Anne / Anna (Орден Святой Анны) is a Holstein and then Russian Imperial order of chivalry established by Karl Friedrich, Duke of Holstein-Gottorp on 14 February 1735, in honour of his wife Anna Petrovna, daughter of Peter the Great of Russia. Membership of the Order awarded for a distinguished career in civil service or for valour and distinguished service in the military. The Order of Saint Anne entitled first class recipients to hereditary nobility while other recipients to personal nobility. At first, the order had but one class and was named the "Order of Anna". 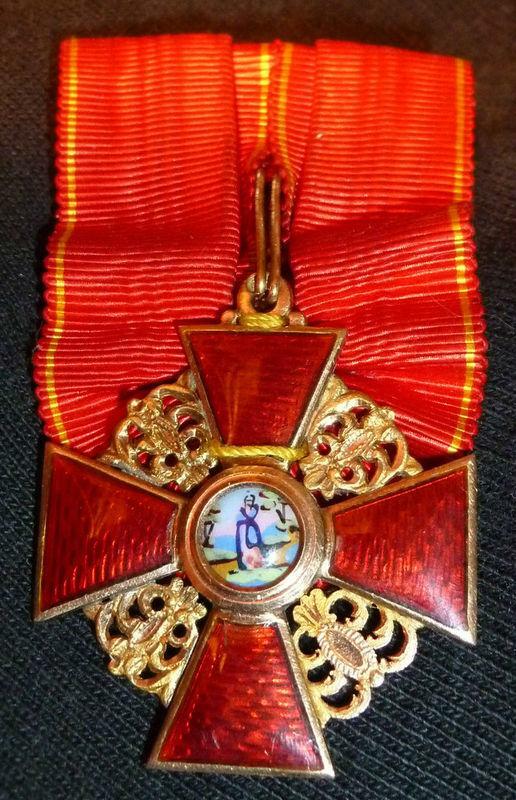 The statutes of the Order promulgated in 1735 established as the principal insignia a red-enameled gold cross, with an image of Saint Anna imposed upon the centre of the cross; the first medals bore the reverse cameo with the initials "A.I.P.F." (for "Anna Imperatoris Petri Filia": "Anna, Emperor Peter's daughter" in Latin). The same letters also abbreviate the Latin motto (as the letter "J" did not exist in Latin, "Iustitiam" was the original spelling of the word now rendered "Justitiam"). In 1742, Karl Peter Ulrich, Duke Karl Friedrich's son, was declared the Russian heir apparent. After arriving in Russia, he presented the Order to several courtiers. On 15 April 1797, his own son, Emperor Paul I of Russia, established the Order as part of the Imperial Russian system of honours and divided it into three classes, renaming it the "Order of Saint Anne ". Czar Alexander I added a fourth class in 1815.